Now you’re a pretty smart person and you really don’t want to “waste time” on much of anything, you’ve got too much to do, see, be, etc. So when YOU call on YOU to take note of something then there is a very good chance that you will benefit in some way by taking note of it, by recognizing your valuable attention could be invested in a moment that could very well produce substantial ROI (return on investment). In other words by sending a little more attention to that thing that caught your eye or simply to that moment, you are allowing YOU to be rewarded with a treasure from universe, from your heart or soul’s intent. The experience is very akin to opening up a mysterious treasure that you KNOW benefits YOU, and sometimes others as well. Maybe you won’t “see” the treasure immediately but rest assured that the benefit, however big or small, becomes a part of you to access or utilize. So how did I come to relay this carat of wisdom? The answer is its not unusual for me to become inspired or “tuned in” to the moment when I ALLOW my attention, energy, focus to follow what caught my eye. Today as I was leaving to go to my day job I noticed one of my newly created coffee mugs on the photography table. Now, I had thought about this mug earlier today, at sometime during the night, perhaps in between dreams. So this morning I picked up the mug and brought it to work with me. Just doing that made me feel joy because I was honoring me, by honoring creation in the form of that mug. 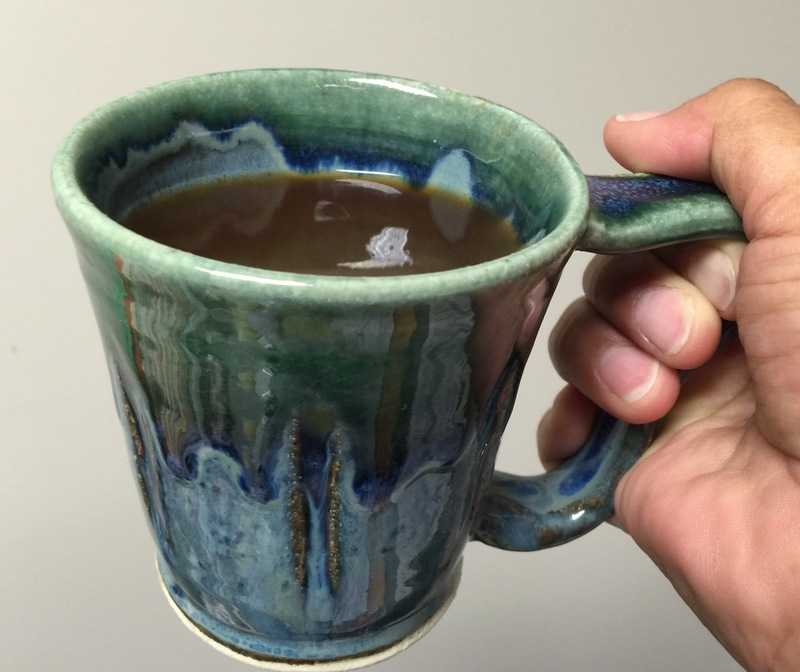 While drinking my first cup of coffee at work I was observing the “drinkability” of the mug, from how it sat in my hand to weight and balance, to the feeling of the rim of the mug against my lips as I sipped my coffee. Within a few moments I found myself in awe of creation of this mug on a level that was more than the sum of its parts. I was honoring me and my loved ones, and I was honoring Creation. A mug that I created earlier this year inspired me to thank Creation and to share with YOU one of the easiest ways to exercise Love. Thank you fancy-handled green and blue mug!